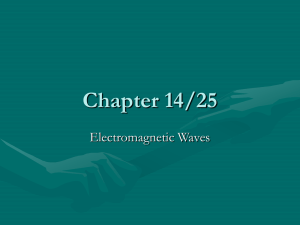 back and forth by applying a alternating electrical voltage to the mast. 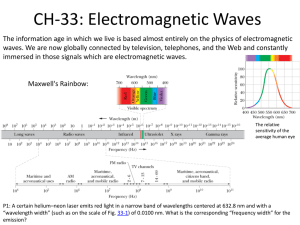 are located on the far left of the spectrum and the shorter wavelength, higher frequency regions are on the far right. locate likely fish holding areas of the river. So how does this amazing optical material work? light that is horizontally polarized. See diagram b.
surface therefore cannot get through the polarizer and is thus eliminated. is affectionately known as ROYGBIV. traveled the extra distance across the diameter of the earth’s orbit. to turn on-eighth of a rotation, the light would be reflected into the eyepiece. If too slow or too fast it wouldn’t enter the eyepiece. Michelson received the 1907 Nobel Prize in physics for this experiment. He was the first American scientist to receive this prize. sun to earth, and 4 years from the next nearest star Alpha Centauri. The distance light travels in a year is called a light year. 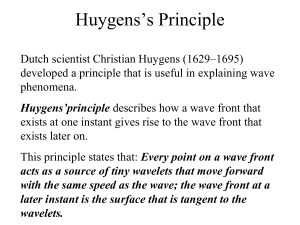 is also waves. 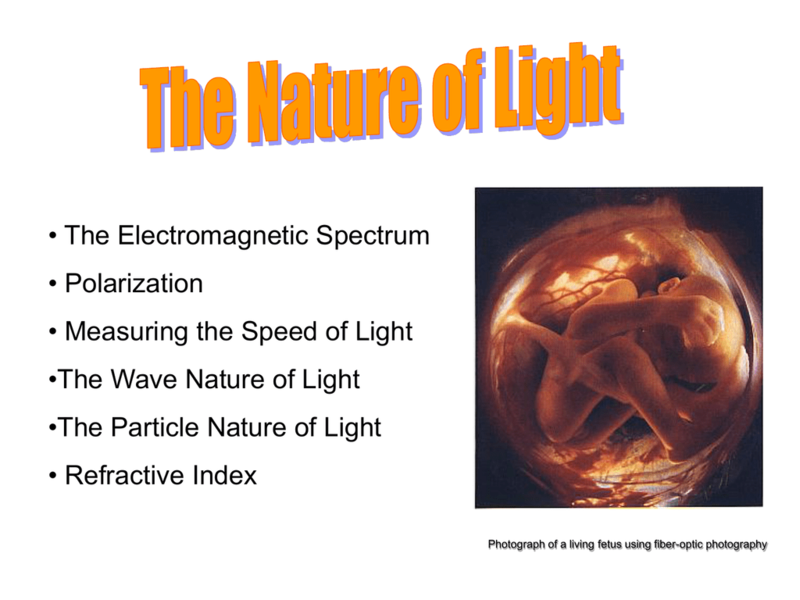 The energy of a photon is proportional to its frequency and all the photons of a given frequency have the same amount of energy. 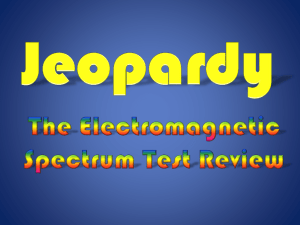 What is a) the frequency of a 450 nm light wave? 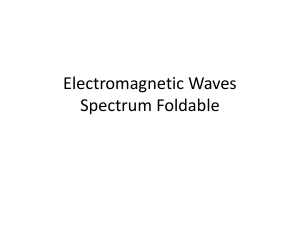 b) how much energy would each photon have and c) what color is this wavelength? 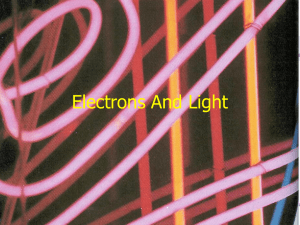 Light particles have small amounts of energy which can be expressed as electron-volts. How much energy does a blue light particle carry in eV’s? 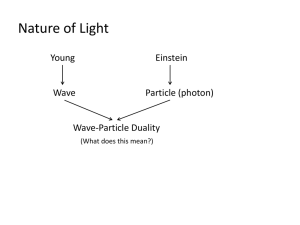 light source (predicted by photon theory, E = h f)) and not the intensity of the light source (predicted by wave theory). 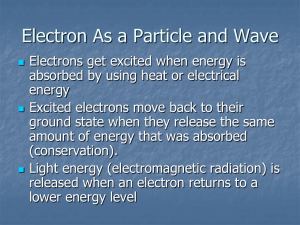 If each photon carries more energy it will give the electron more KE when it hits it. work function and is specific for the type of metal plate used. 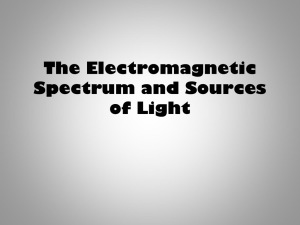 If ultraviolet light interacts with an atom that has the same natural frequency, the vibration amplitude of its electrons becomes unusually large. makes many collisions with other atoms and gives up its energy in the form of heat. That’s why glass is not transparent to ultraviolet. to begin with. 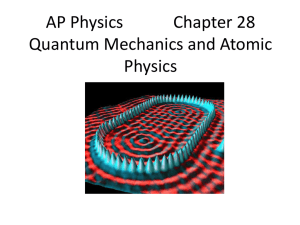 The main difference is a slight time delay between absorption and reemission. these materials into the air, it travels at its original speed, c.
What is the approximate index of refraction of water?